I can't believe it's been a week since I've written in this blog. I've been neglectful so please forgive me. The only thing I've been consistant with lately is going to the gym, feeding the stray cats and writing for money. Believe me, that takes up most of my time. and now I'm going to be writing more. I've just been hired to write for Wire the weekly tabloid that I wrote for ten years ago (new owners two times over). I'll be writing a feature every other week and one cover story a month as well as contributing photography. I'm reallly going to have to budget my time if I'm ever going to finish my second book LAUREL AVENUE. I'm still trying to get my first book SOUTH BEACH STAR published. I have an agent but it's still not sold yet. Last Saturday I went to performances for SLEEPLESS NIGHT. I thought I was going to be able to go all night but after almost 7 hours of performances (including biking all over the beach from stage to stage) I was exhausted. I saw some really great shows including circus acts performed by South Florida Circus Art School, a dixieland band, a dance troup on wires, a Barcelona clown troupe and Hot in the Tropics at the Colony Theatre (Adora, the Miami Gay Men's Chorus, Dragout, and the group BETTY). It was quite a night. Tonight I'm seeing the Broadway version of the movie Legally Blonde at the Broward Center of Performing Arts. Gotta go and write another chapter for the book that's not mine. I'm hoping to finish this book before Christmas so I can start concentrating on mine. 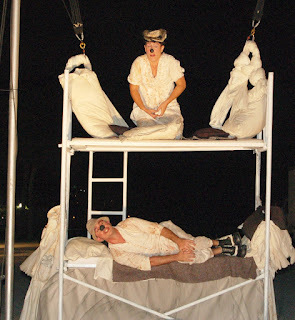 Photo: Sleepless Nights performance of Industrial Teatrera "ROJO."